Carly joined our team in 2012 as a legal administrative assistant. In 2015 she moved into a paralegal role, supporting senior directors and associates in our Plaintiff Bodily Injury group. Carly guides clients through very difficult times—she keeps them up to date on their files and ensures that all the necessary steps are being taken to get to the best resolution. Carly is involved in every phase of the litigation process. Her daily work involves preparing files for examinations, discovery and trial, managing communication with clients and opposing counsel, drafting pleadings, retaining experts and organizing evidence. 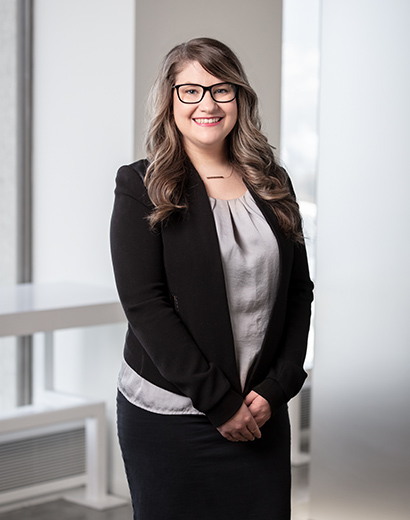 Before Carly became a paralegal, she worked as a dancer and performed in various events and venues throughout lower mainland Vancouver including the closing ceremonies of the Vancouver 2010 Olympics, the Queen Jubilee and Vancouver Giants games.